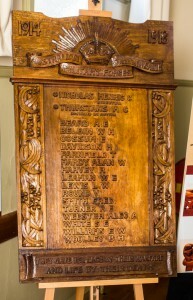 Honour Roll carved date unknown, Webster Ltd . Who was Nellie Payne? Webster Ltd is a long established Tasmanian rural and agricultural products company and the honour roll lists those of the company who served in World War One. It lists 18 names. Monument characteristics :The polished wood honour board has a carved insignia of Australian Commonwealth Military Forces at the top and carved patterns on either side of the carved names. Webster Limited is Australia’s fourth oldest business. It commenced operating in 1831, just 28 years after the settlement of Van Diemen’s Land, as a traditional pastoral house. One hundred and eighty years on, it is now a diversified food and agribusiness with a growing reputation locally and internationally for the quality of its produce.